Hear firsthand from this Surrealist painter about his process and portfolio of artwork. Jacques de Beaufort is an artist and filmmaker living in Lake Worth, Florida where he is an Associate Professor of Visual Art at Palm Beach State College. Over the last decade, since receiving his MFA from the California Institute of the Arts, de Beaufort has worked steadily towards the construction of a unique and visionary surrealist cosmology expressed through his paintings created while working “in the contemporary space, but to always be reaching for a realm that exists outside of now but simultaneous with both the past and present”. De Beaufort has exhibited extensively in South Florida, New York, Los Angeles, Chicago, and London and has received substantial critical support for his work including his first feature length film Sanctum and Sacrum, music videos and the founding of his project space UNIT1 Exhibitions in Lake Worth, FL. 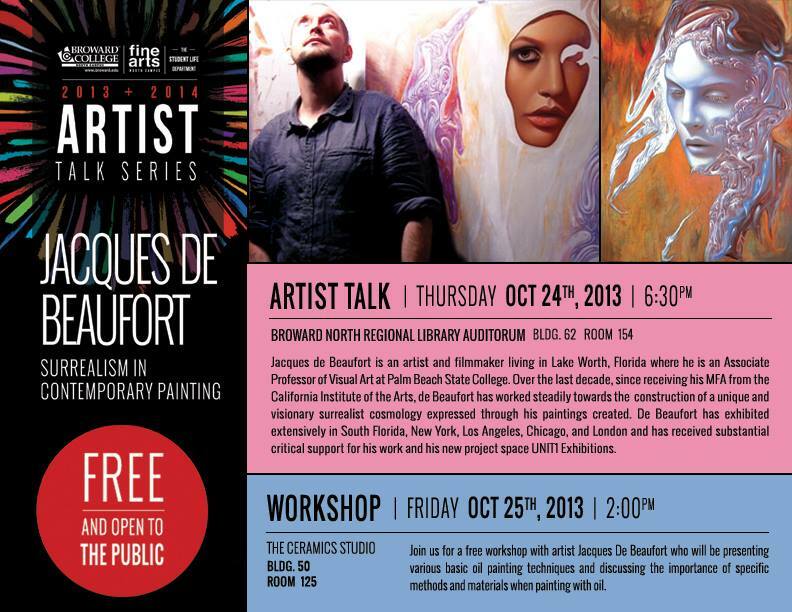 Broward College’s North Campus expands upon its inaugural 2012 / 2013 Artist Talk series with a new line-up of some of South Florida’s most groundbreaking, local and internationally acclaimed artists visual artists. Each of the up and coming and internationally renowned artists involved will present the diverse concepts and aesthetics within their respective bodies of work and direct a hands-on workshop the following night to further allow the public to experience and learn from their artistic processes. This Talk is part of a series. Each artist will also lead a free workshop the following day.